Every year when Collingwood plays Essendon in the AFL’s annual Anzac Day match, Collingwood president Eddie McGuire carries an old horseshoe into the team’s changing rooms and passes it around. The players examine it as he relates the great footy club story behind it. It’s early in the twentieth century and Doc Seddon, a Collingwood player, introduces his childhood sweetheart, Louie, to his dashing team mate, Paddy Rowan. Paddy sweeps Louie off her feet and they marry. But war intervenes. Doc and Paddy go off to fight, leaving Louie to raise Paddy’s baby. When Paddy is killed, Doc promises that he will always look after Paddy’s wife and child. Just before the 1917 Grand Final, he sends a horseshoe back from the Somme, where he continued to serve. It brings the Magpies luck - they win. It is a lovely story. Except, of course, that fairytales didn’t come true in Collingwood, the biggest slum of Melbourne. What really happened to them is a much grittier tale. I was originally intrigued by this book, as my own grandparents had met at the Yarra Falls factory behind Collingwood’s spiritual home, Victoria Park in the 1930s. Also, being a lifelong Collingwood fan (passed on by my grandparents through my dad) drew me to the book. Journalist Paul Daley has written a personal and touching story based on handed oral history and family tales. It takes in the Collingwood Football Club as important community hub; the history of a tough, poor neighborhood in a very wealthy city. And lastly and most importantly, it’s a love story between Doc and Louie, who grew up a few doors from each other. From their early childhood, their love for each other was apparent. 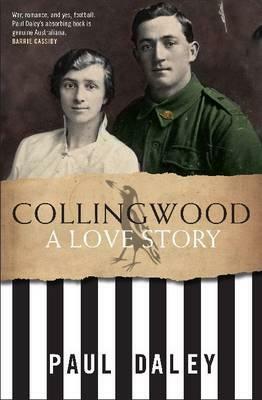 The book takes in the very beginnings of Collingwood entering the then-VFL at the end of the nineteenth century, how important it was to the people of the suburb and an interesting social history of what life was like for the people of ‘the flat’. The book also follows Doc and his best mate Percy Rowe (also a team mate at Collingwood) to Europe and World War I. The tragedy that follows is of course a very familiar one, as thousands of young Australians lost their lives miles from home. A touching tale, told very skillfully. Every year as Collingwood prepares to play Essendon at the AFL's annual Anzac Day match, Collingwood's president, Eddie McGuire carries an old horseshoe into the team's changing rooms and passes it around. This book provides dramatic insight into what makes up a modern AFL club from the inside. This is not just a book for magpie fans it is a book that explains the truth of what is required to be a great sporting club.